The highlight of Luis Suarez’s childhood was his poverty. His mother scrubbed floors and his father abandoned them. 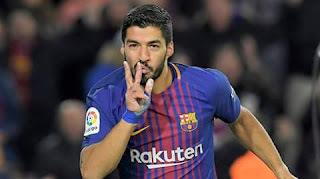 Suarez, who was entering his teenage years, started skipping practice, drinking and staying out late and his coach had to often drag him from his home for practice. Then at the age of 15, he met a girl. Her name was Sofia Balbi. Her family lived a comfortable life while Suarez worked as a street sweeper and during his shift he would pick up coins to take her out. Sofia’s family took Luis into their home. 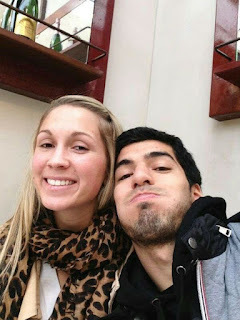 She made Suarez work harder; she made him realise that his laziness was the reason why he was struggling. In her family, Suarez finally found something he had never felt before: a sense of belonging. In 2003, Sofia’s family moved to Spain. This left Suarez heartbroken; he lost his family, he lost Sofia and he lost his determination to play. At this point, no one would believe that this boy would take the football world by storm later on. She lived in Europe and he lived in South America, he could clean streets for the rest of his life and not afford a plane ticket and never see her again. This prompted him to work hard on his football so that one day he would be good enough to play for a club in Europe. In 2006, a small first division club from Netherlands gave him a chance and from there he moved to Ajax, then to Liverpool and now to Barcelona. In 2009, he married the girl who gave him everything when was nothing. Suarez became a great player because of Sofia and today she is the mother of his two kids. How great would such a love story look on the silver screen?